Smolensk can prove too easy to get to. It is located right on the M1/E30 highway connecting Moscow and Eastern Europe countries, and at about 300 kilometers from the capital. 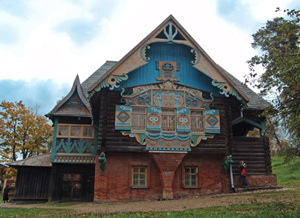 Despite the devastation that came with countless wars between east and west, Smolensk and its surroundings have preserved magnificent sights that are an absolute must-see for anyone interested in Russia's true face. Here is a weekend route `there and back' that is simple enough for even a novice in exploring Russia. It starts from the M1/E30 highway, and returns along the M9 road (also known as Novaya Riga). You surely can't miss the museum of armored vehicles here, about 40 minutes from Moscow: the entrance is decorated by a picturesque, Joseph Stalin-3 tank. The spot is actually the base of the army's best tank unit, but today there's much beyond barracks and soldiers here. The museum is a brilliant collection of tanks and armored cars, beginning with the First World War. Vehicles from the Second World War are the core exhibition, which includes the gigantic Maus tank, the last and desperate weapon of the Third Reich. There are also monstrous Soviet heavy tanks, the last of which where developed under Nikita Khruschev when construction stopped. New items are added to the collection even now, though today the work of the restoration crew has unfortunately stopped. The name is maybe the most glorious one for any Russian, as here the battle between Napoleon and Russian troops under the command of Mikhail Kutuzov took place in 1812. The battle ended when the French army formally won the day; however Russia proved the long-term winners. Napoleon's troops lacked manpower and food for men and horses, as well as to Russia's remarkable dimensions and partisan activity. Today's Borodino is the place of pilgrimage and excursions; there are chapels and monuments devoted to those who died in the battle. On the first weekend of September a mass reconstruction will take place there, featuring amateur and professional historians wearing both uniforms of 1812. This small town features many architectural monuments - despite the numerous wars and disasters it underwent. This is partly due to its key location on several active trade routes. One of the ancient Kremlin towers can still be seen: The Spasskaya tower, the only artifact of the bygone fortress, looks serious and far from glamourous (compared to the Moscow Kremlin, for example). Between the 15th and 17th centuries Vyazma was conquered several times by Polish troops, and retaken by Russians. The real peak of the town's power and glory was during the 18th century, when Vyazma became one of the most important hubs to transfer goods (wheat and rye among the most important) from the south districts of Russia to St. Petersburg. After three major wars devastated the town (1812, 1914-15, 1941-43), most ancient churches (there were 22 of them before the Napoleonic wars) were destroyed. Some still stand, including the John the Baptist monastery. Two of its churches are considered important artifacts of Russian baroque of late 17th century: Odigitria church with three cone domes, and Resurrection church, a more traditional one. The town is among the oldest in Russia, and is mentioned in the oldest existing chronicles. This city, upon the river Dnepr that once served as an important trade route between Northern and Southern Europe, was a perfect spot for a protected base controlling the river. Its three hills were natural fortresses. In the early days of Smolensk the town was ruled not by a duke (knyaz), but by primitive democracy (veche). In those times the fortress of Smolensk was made of wood - nevertheless, walls and towers were strong enough to withstand major sieges. The stone Kremlin that has been partly preserved until now, was erected at the very end of 16th and beginning of the 17th century. The Kremlin used to have 38 towers, 17 of which remain now. Most preserved towers and walls are located at the eastern part of the fortress. The Kremlin served as a fortress even in 1812, when stone walls and towers were already somewhat archaic. Among the most important things to see in Smolensk are its 10 old churches, including St. Peter & Paul (Petra I Pavla) beyond the Dnepr - built in 1146. Just consider the date of its construction: you'll see that some provincial towns can show Moscow a thing or two. Another old church, John the Baptist, was built in 1176 - there are not more than two dosens of such buildings in Russia. The third old cathedral, Michael the Arch-Angel, was built in 1180: it is a representation of Smolensk styling, that had been formed by the time. This town used to be called Gzhatsk - an important hub for wheat and rye to be transferred to the north. Now named after Yuri Gagarin, the world's first cosmonaut. Here is where the museum of Gagarin can be found, as well as some old churches built in the second half of the 18th century.